WhiteCloud Software Ltd. announced the release of version 4.5 of EAComposer. An innovative and easy-to-use enterprise architecture tool. Use it to manage your IT landscape and technology portfolio. Delivered as a pure SaaS product: cloud hosted with a subscription based license model. With this release we enhanced the IT Capability model, added several new reports, new heatmaps, more out-of-the-box sample data to help you get started and several feature enhancements as well. Read more details below. - Updates to the metamodel: The metamodel defines the structure of your repository and in this released we updated this with more predefined extended properties for you to leverage. Just fill in the data for your components and start getting insight! - Enhancements to the Capabilities & Functions model: We made several updates to the Capabilities and associated Functions model. EAComposer aims to keep things simple and uses a two layer business model. Top layer we call Capabilities and these can be broken down into Functions. - Enhancements to Architecture Portfolio: We added more sample data in the Architecture Portfolio to assist in your usage and understanding of EAComposer. It now includes data for all the different components that are part of the default metamodel. - Enhancements to Reporting & Analysis: Getting insight from your architecture repository is a key outcome of adding all your architecture components (your applications, data stores, interfaces, configurations) into EAComposer. We continue to improve how you can obtain this insight. 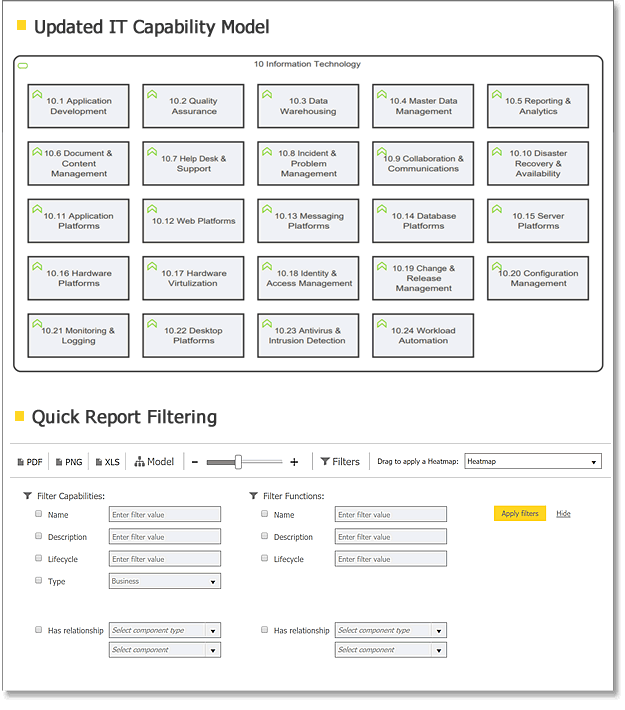 We made several enhancements to our Reporting & Analytics section with improved filtering, new reports and new heatmaps.